The core of the ‘Microlights Experience’ is based on exceptional sales consultancy and after-sales service, while developing state-of-the-art products that meet the demands of the retail environment. Microlights Design and Development engineers understand that client expectations can change at any time due to changes in store layouts, developments in technology and more diverse products available on the market. This means that original designs may not fit the retailer’s brief or a totally new product may need to be created to meet their aspirations. Their clients also require the convenience of a single source for the complete package of store lighting. With their state-of-the-art lighting laboratories, performing precise measurements to gain critical data on luminance and angles from individual lamp sources and luminaires, is also seen as core to their development services. As LED’s have been playing an ever increasing role as an alternative to conventional lighting solutions, this has led to the need for the research and development process to focus far more time on efficient design of the cooling strategies. The more power the LED can convert to light the better the performance will be. In order to help design a new LED light fitting as quickly as possible, within some very tight client deadlines, Microlights commissioned 80/20 Engineering to provide some additional consultancy assistance to their design team in Swindon. 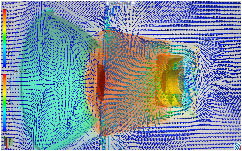 Shown below is a brief summary of a comparative CFD study of a series of concept heat sink designs. An LED lighting fixture normally consists of a LED component mounted on a PCB within a sub-assembly that then connects to the lighting fixture or housing. Within the complete assembly a heat sink is normally found whose main purpose is to dissipate the heat lost. The life of LED’s are dramatically enhanced if the peak temperatures are kept below critical values. Managing the convective airflow paths within and around the heat-sink efficiently can substantially reduce these peak temperatures. 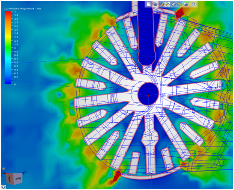 Using CFD simulation, a complete three dimensional thermal map can be obtained from any concept being considered and once a concept is selected further simulations can be carried out to refine the idea or test the impact of manufacturing or cost constraints. CFD techniques also help the design engineer really understand why a mechanical product has certain behavioral characteristics in that the airflow paths can be easily visualized and re-circulation, or dead zone areas, understood so that design changes can be made that enhance the heat transfer process. Using CFD simulation for thermal performance prediction Microlights can dramatically reduce the amount of physical prototypes and test work required, which will either reduce product development lead times or enhance the quality of the product received by the end retail client.